Titan Poker is one of the better known online poker rooms today, and you can get started playing there by using Titan Poker bonus code FTRIVER when creating your account. 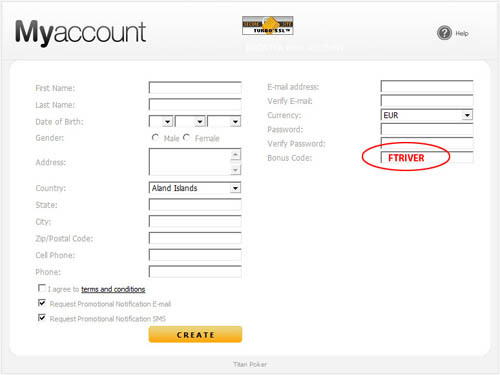 See the screenshot above to find the right field to enter your bonus code during the account creation process. There’s no excuse for failing to take advantage of Titan Poker’s whopping 200% up to $2,000 maximum bonus! Even if you’re going to be using a currency other than USD, Titan Poker has you covered. You can receive up to €1,500 or £1,200 for a little help building your account balance while playing your favorite poker games. In order to earn the bonus, you must play real money games and collect Titan Poker Points. Once your points start to rack up, you will receive $5 of your bonus for every 300 points. So in total, you need to collect 60 points per dollar or 120,000 for the entire $2000. Different currencies clear at different rates, please make sure to check the Titan Poker website. Don’t delay though – you only have 60 days to earn as many points as you can to unlock your bonus payments. After this time, any remaining uncleared bonus portions are lost for good. In addition to this fine first deposit bonus, Titan Poker rewards its new customers with four entries into $2,500 freeroll tournaments, a free ticket to the monthly $10,000 bonanza tourney and access to special beginners freerolls that run six times a day and are only open to those who have signed up within the previous 90 days. Moreover, upon making your initial deposit, you will receive 10,000 Titan Treasure Gold Coins, which will allow you to participate in a unique lottery program wherein every ticket is a winner. 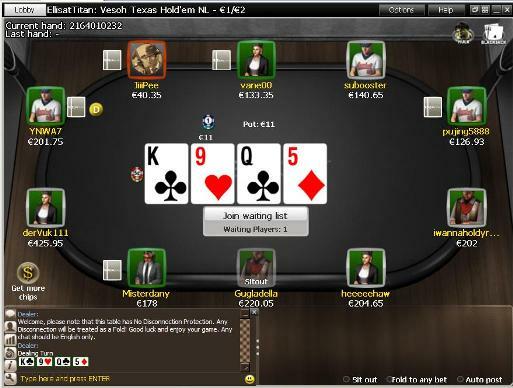 The iPoker Network uses a weighted rake system, which will make clearing the bonus much easier. The amount of rake a player earns will be determined by the amount of money they committed to the pot. Once the math shakes out, they will be awarded 15 points for each $1 of rake generated, 20 points for each €1 of rake, and 24 points for each £1 of rake. They’ll also be awarded 17 points per $1 of tournament fees paid, 23 points per €1 of tournament fees, and 27 points per £1. For every 300 points you earn, you’ll receive a $5 chunk of your bonus. Players using euro or GBP as their currency will have a different schedule for releasing their bonus; check the Titan Poker website for full details. To clear the full $2,000 bonus, you therefore will need to accumulate 120,000 points. This works out to $7,059 in poker tournament fees for a cashback rate of 28.33%. Since points are awarded at a lesser rate at ring games, $8,000 in rake must be generated to earn the $2,000 bonus at cash games corresponding to a cashback rate of 25%. Of course, these numbers are heavily dependent upon the currency your account balance is held in as well as the currency of the tables you’re playing at. Check out the sidebar to the right of this page for more info on how long it will take for you to earn the full bonus at the stakes and games of your choosing. As you can see, it’s nearly impossible to clear the full bonus at 25nl full-ring, requiring half a million hands. But at 200nl 6-max, it can be done in fewer than 100,000 hands, which shouldn’t be too hard to achieve within the 60-day time limit. Tournament players can play 2,353 $30 + $3 events to collect the entire $2,000 bonus. The great thing about this bonus is that it pays out in convenient $5 pieces, allowing even micro-stakes grinders to achieve some return from their bonus. Titan Poker well understands the difficulty of getting started in poker if you’re a newcomer to the game and has therefore designed a unique promotion for beginners. 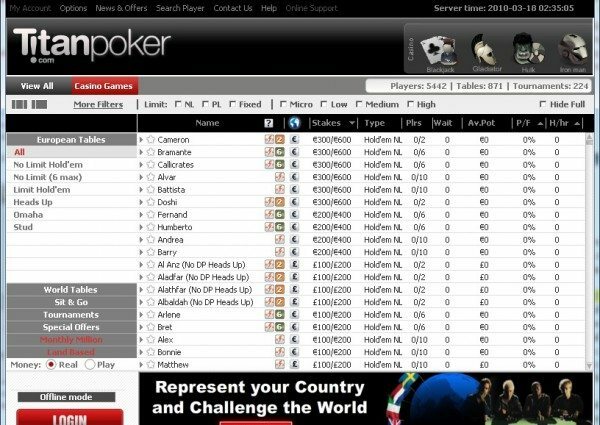 There are special beginners tables that are open only to customers who have created their accounts within the past three months. Every week, players at these tables compete for a total of 150 prizes based upon a raked hands leaderboard. As long as you can play at least 300 raked hands per week, you stand a very good chance of picking up a share of the $750 prize pool. While clearing your bonus by collecting Titan Points, you’ll be increasing your rank within the Titan VIP Club at the same time. The higher you climb the ranks – starting at Bronze and proceeding towards Diamond – the more Club Points you’ll receive for every Titan Point you earn. You can use these Club Points to purchase cash bonuses and tournament tokens. Savvy players at the Diamond level who maximize the value of their points can achieve a rate in excess of 50% in rakeback equivalent! There are also special rake races and freerolls for members of the VIP Club. Again, make sure you use the Titan Poker Bonus Code FTRIVER to be given credit for this bonus!